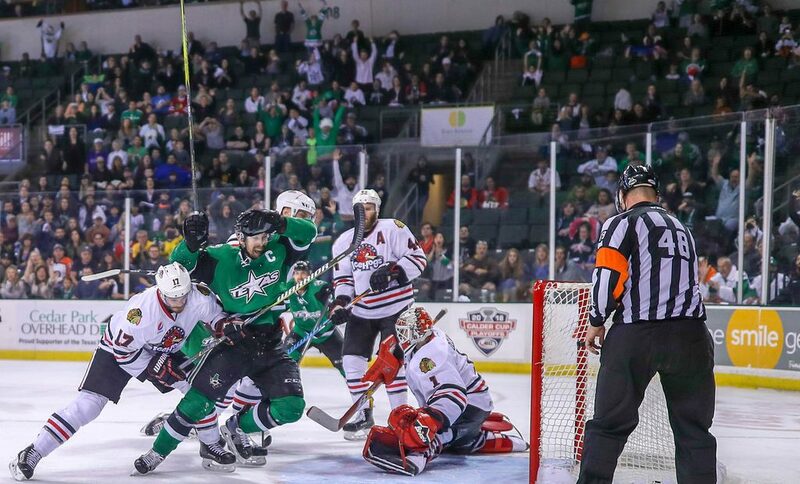 The Rockford IceHogs headed to Texas this weekend looking to take at least a game at the HEB Center to open the Western Conference Final with the Stars. That didn’t happen. The first two games were rife with opportunity. However, Rockford dropped Game 1 on Friday and Game 2 Sunday. Texas leads the series 2-0 as the action now shifts to Winnebago County for the next three games. The BMO could be the difference maker for the IceHogs, though Texas earned their advantage with some hard work around the net. Greasy goals did the trick in a 4-2 Stars win Friday night. A put back in overtime made Texas 3-2 winners Sunday. Game 1 of the Western Conference Final did not turn out the way the Hogs wanted. 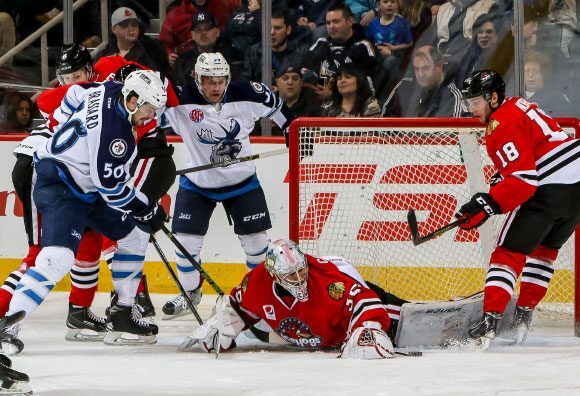 Rockford was outworked in front of the net, dropping its first postseason game. Texas was active around the net early. After Dillon Heatherington caught a post on a shot attempt, the Stars swarmed the crease of Hogs goalie Collin Delia. Curtis McKenzie knocked in a loose puck 4:22 into the contest to give the Stars a 1-0 advantage. The Hogs responded midway through the first period on the power play. Carl Dahlstrom took a page from fellow blueliner Cody Franson’s book to tie the game. As opposed to Franson’s happy place, the left dot, Dahlstrom sent his left-handed shot from the right dot, one-timing Chris DiDomenico’s pass into the Stars cage at the 11:19 mark. The Texas response was quick. Roope Hintz, who had gained separation from Rockford defenseman Gustav Forsling, took a stretch pass from Denis Gurianov and entered the IceHogs zone on a breakaway. Hintz was able to five-hole Delia and the Stars led 2-1 at 12:37 of the first. Texas took that lead into the locker room. DiDomenico evened the score for Rockford early in the second stanza. Darren Raddysh fired toward the Texas net from just inside of the Stars blueline. Lance Bouma got a stick on the puck in front of the net, sending it over to DiDomenico at the bottom of the left circle. The attempt beat Texas goalie Mike McKenna and nestled into the ropes at 4:35 to make it a 2-2 game. The Stars regained the lead at the tail end of a power play a few minutes later. Remi Elie finished off the scoring play by knocking another loose puck in behind Delia 8:47 into the second. The IceHogs kept the pressure on the Texas defense but couldn’t solve McKenna and entered the second intermission on the short end of the scoreboard for the first time this postseason. Rockford gave up a key goal 7:18 into the final frame after a Sheldon Dries pass attempt was broken up in the slot by Viktor Svedberg. The loose puck came back out to Dries at the left dot. The rookie forward settled the puck and backhanded a shot toward goal. The attempt got the best of Delia, who appeared to have an obstructed view courtesy of Stars forward Jason Dickinson. The puck got through on the far side of Delia’s net to make the score 4-2 Stars. That was too much for Rockford, who mustered only five shots in the final 20 minutes after sending 28 McKenna’s way in the first two periods. The Stars goalie stopped 31 of 33 shots on the night. Too much time in the box did in the piglets in Game 2. Collin Delia stopped 34 shots but it wasn’t enough to keep Texas from going up 2-0 in the Western Conference Final. Rockford got on the board at 6:09 of the opening period. Andreas Martinsen got the scoring play started when he won control of the puck behind the Stars net. He sent it out to Adam Clendening at the right point, who then got it back to Martinsen at the right dot. John Hayden was in front of the net waiting for a centering pass…and got it. Whiffing on his initial attempt, Hayden slid home the lamp-lighter under Texas goalie Mike McKenna for a 1-0 Hogs advantage. Texas scored the next two goals in the first half of the second period. Jason Dickinson struck from the right dot after getting a cross-ice pass from Matt Mangene at the 2:45 mark. The Stars took a 2-1 lead after a shot from Brent Regner pinballed off the stick of Luke Johnson, the ice surface and the right post before settling into the net for a power play goal at 8:15. The power play allowed Rockford to even the score less than two minutes later. After a 5-on-3 chance ended, Cody Franson threaded a circle-to-circle pass to Chris DiDomenico. Streaking to the far side of the right circle, DiDomenico sniped the equalizer past McKenna at 11:09 to make it a 2-2 game. 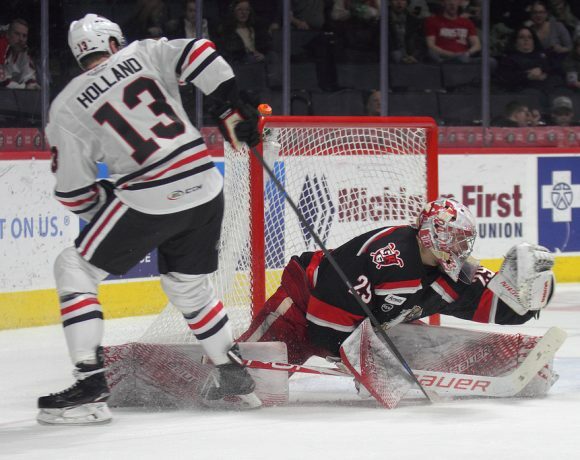 Despite the Stars dominating the third period, Hogs goalie Collin Delia kept his team in contention, anchoring a Rockford penalty kill unit that negated four Texas chances. 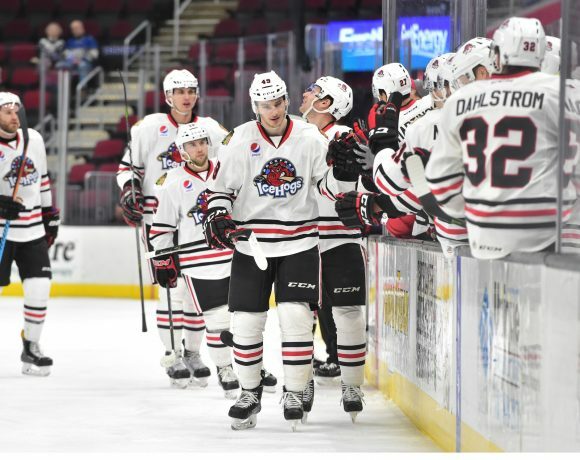 The IceHogs were out shot 12-4 but took the game into overtime with a chance to steal Game 2. Rockford let a huge opportunity to end the game slip away when Victor Ejdsell started a 2-on-1 rush with DiDomenico five minutes into the extra session. Ejdsell tried to make a late pass which was broken up by McKenna’s stick, ending the threat. Curtis McKenzie was tripped by Gustav Forsling 10:08 into overtime, leading to the game-winner. McKenzie did the honors on the subsequent power play, knocking in a rebound of a Brian Flynn shot to end the contest. Game 3 will be at the BMO Harris Bank Center on Tuesday night. Game 4 is set for Thursday with Game 5 the following night provided the Hogs pick up a win in this series. Follow me on twitter @JonFromi for thoughts on Rockford’s postseason run.